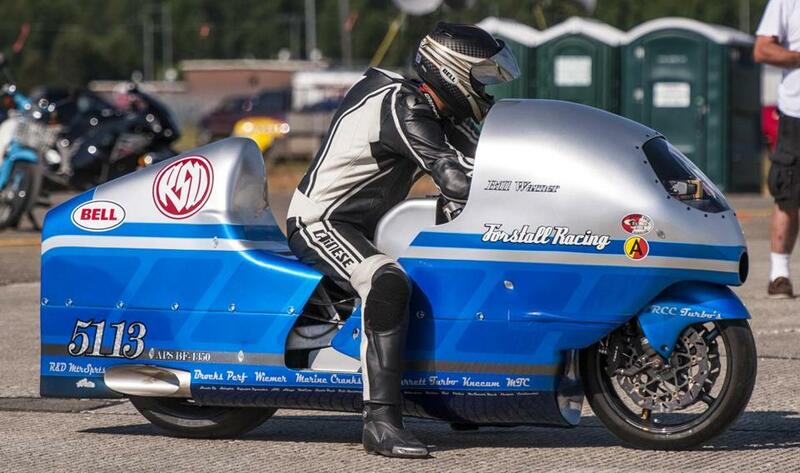 Bill Warner, died when his motorcycle like the one above crashed on a Maine speed track in July. Bill Warner, a 44-year-old marine biologist and tropical fish farmer from outside Tampa, died last Sunday after crashing his motorcycle in Limestone, Maine. He was clocked at 285 miles per hour when his ride went awry. For the record, which was what Warner was all about, his speed was well below the 311-m.p.h. world record he posted on the same Limestone race track two years earlier. The mild-mannered Warner was a veteran of land-speed racing, a somewhat obscure art form of the big, crazy world of speed that encompasses everything from backyard dirt bikes to, well, motorcycles that rocket down old Strategic Air Command runway strips at speeds more common to a B-52. Warner’s misfortune has brought attention to a sport that few likely knew about or cared about prior to his fatal run. Because of the high speeds being chased, land-speed racing requires humongous tracks that include straightaways of 2-3 miles or more, which not only limits spectators’ viewing ability, but also the number of adequate, suitably sized venues. The Limestone site, once the home of the decommissioned Loring Air Force Base, is one of only five LSR tracks in the country, and one of them is the famous Bonneville Salt Flats, the mecca of all wheeldom located in northwest Utah. “I’ll bet 75 percent of the people who follow racing don’t even know that much about LSR,’’ said Jody Perewitz, 30, a land-speed racer from Bridgewater who was at Limestone last Sunday and witnessed Warner’s final run. “It’s not a highly publicized sport. In my opinion, it doesn’t get the coverage it deserves. Such is the sad irony of Warner’s death. Few in the racing world at large knew of him prior to Sunday’s crash. Now he’ll be remembered as that guy who was tops in his field, in a sport that few knew existed until he was killed doing it. If not for the obvious tragedy, it might read like one of those short, sardonic lines from Mark Twain or a W.C. Fields one-liner. No one last weekend could say for certain what happened on Warner’s last run, his second attempt that morning to crack the 300-m.p.h. barrier with his 1,200-horsepower Suzuki bike. It could have been mechanical failure. It could have been driver error. Or it could have been plain bad luck, the deadly caprice of a stray pebble or twig on the track, or the faintest crosswind that swiped the bike from his hands and sent Warner to his grave. Perewitz, a 2005 UMass-Dartmouth grad, two years ago set a world land-speed racing mark at the Bonneville Salt Flats, where she posted a sustained speed of a little more than 200 miles an hour. Her record mark, 203, is the fastest a woman has ever driven an American-made bike, albeit a touch slower than the 234 m.p.h. Texas speedster Leslie Porterfield has notched on her Japanese-made model. From her experience, Perewitz said it becomes harder to handle a bike as its speed increases. The Limestone track, she noted, is slightly sloped, or crowned, designed to prevent rainwater from puddling. Water and debris can be very dangerous. The greatest risk factor can be the wind. Due to the track’s slope, it can already be a chore to keep a racing motorcycle on a straight line. Add an unexpected wind gust and it can play havoc with rider and bike. Three miles an hour, wind moving at the rate that an average adult might walk. But potentially deadly when lazily cutting across the path of man and machine whizzing by at a rate approaching 300 miles an hour. According to Perewitz, there were approximately 200 people, racers and spectators included, on hand for Warner’s last run. As always, she said, the place came to a standstill and all eyes focused on the track when the announcer called him to the start line. Seconds after Warner blitzed by her, Perewitz could hear the noise of the crash, with dust and debris flying in the air. One report said the bike veered to the right and then launched 40 feet through the air. For Perewitz, that was too far down the track to see. The ambulance rushed Warner to Cary Medical Center in Caribou, Maine. Approximately an hour and 15 minutes after the crash, at around 11:15 a.m., he was pronounced dead. Born in Little Falls, N.Y., on Feb. 11, 1969, Warner was not married and left behind his parents, a brother, and a sister. In a biography posted more than two years ago on dragbike.com, he was asked his goals. Kevin Paul Dupont’s ‘‘On Second Thought’’ appears on Page 2 of the Sunday Globe Sports section. He can be reached at dupont@globe.com. Follow him on Twitter @GlobeKPD.